Print edition: 30 x 21 cm; hardcover; € 29,80. 1. 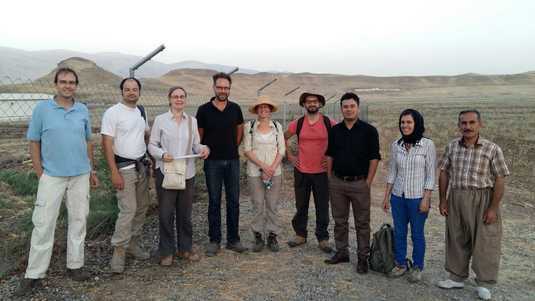 Team members at Gird-i Bazar: From the left: Janoscha Kreppner, Mark Altaweel, Karen Radner, Christoph Forster, Anke Marsh, Andrea Squitieri, Barzan Baiz Ismail, Hero Salih Ahmed, Aziz Sharif. 2. The full 2015 team: Hero Salih Ahmed (Sulaymaniyah Directorate of Antiquities): pottery processing and deputy supervisor, Area East; Mark Altaweel: mapping and offsite archaeology (UCL); Andrei Ašandulesei (Alexandru Ioan Cuza University of Iași, Romania): geophysics and mapping; Peter Bartl (FU Berlin): trench supervisor, Area West; Jörg Fassbinder (Bayerisches Landesamt für Denkmalpflege, Munich): geophysics; Christoph Forster (Berlin, Fa. Datalino): data base creation and photogrammetry; Tina Greenfield (University of Manitoba, Winnipeg, Canada): bioarchaeology; Jean-Jacques Herr (EPHE, Paris): head of pottery processing; Alice Hunt (University of Georgia, Athens, USA): material sciences; Barzan Baiz Ismail (Sulaymaniyah Directorate of Antiquities): government representative; Janoscha Kreppner (LMU Munich & FU Berlin): field director; John MacGinnis (University of Cambridge): trench supervisor, Area East; Anke Marsh (UCL): geoarchaeology; Karen Radner (LMU Munich): project director and epigrapher; Andrea Squitieri (UCL & now LMU Munich): mapping, data base management and documentation; Adam Stone (University of Cambridge): trench supervisor, connecting trench; Muhamad Kahraman Walika: pottery drawing; Eleanor Barbanes Wilkinson (University of Durham): small finds and deputy supervisor, Area West; Aziz Sharif (Sulaymaniyah Directorate of Antiquities): driver; Ibrahim Manla Issa: cook; and 12 workers, mostly from the village of Nureddin. In the eastern part of the mound of Gird-i Bazar, squares 271927 and 271928 and a part of Square 271929 were opened under the supervision of John MacGinnis, as the profile of the section created nearby in the course of the construction of the chicken farm revealed well-preserved floors and walls in this part of the site. In the western part, Square 267931 was opened under the supervision of Peter V. Bartl, as the geophysical results indicated well-preserved architecture here. The longitudinal Connecting Trench between these two areas was opened and its excavation supervised by Adam B. Stone. 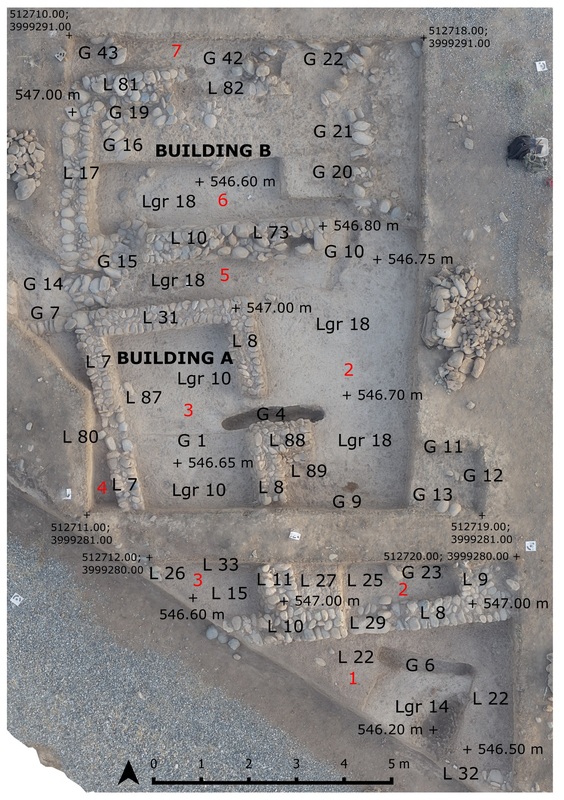 This trench was designed to connect and better understand the separate excavation areas and to investigate whether similar or noticeably different structures and activities were to be found in between these areas. The Connecting Trench has a width of 1.5 m and runs c. 43 m across six squares (270928, 270929, 269929, 269930, 268930 and 268931). It is aligned in roughly north-western to south-eastern direction, about 3-6 m distant from and more or less parallel with the modern cut through the mound. Moreover, the trench was placed in such a way that it traversed a prominent magnetic anomaly recorded in the geophysical survey, which in turn revealed a kiln. In Squares 271929, 271928 and 271927 the main phase exposed an assemblage of architecture, which turned out to be a multi-section complex consisting of two single-room buildings, a courtyard, two alleys, an open area and one other architectural unit whose nature is not yet clear (provisionally called “Outdoor Area 7”). The configurations of the walls indicate that the layout of the complex was not planned in one go but developed over time. This architecture subdivides into three distinct units representing three successive constructional phases, all sharing a common floor. These three architectural phases could be distinguished by differing construction features, including the size of the walls, the size of the cobbles used in construction and the orientation of the walls. • the modern usage period, as evidenced by the drain (Locus 271928:015) and the associated surface. Two medium scale excavations were to be carried out at Gird-i Bazar, one on the eastern side of the mound and the other on the western side, approximately 50m apart. It was decided to excavate a longitudinal connecting trench between these separate excavations. 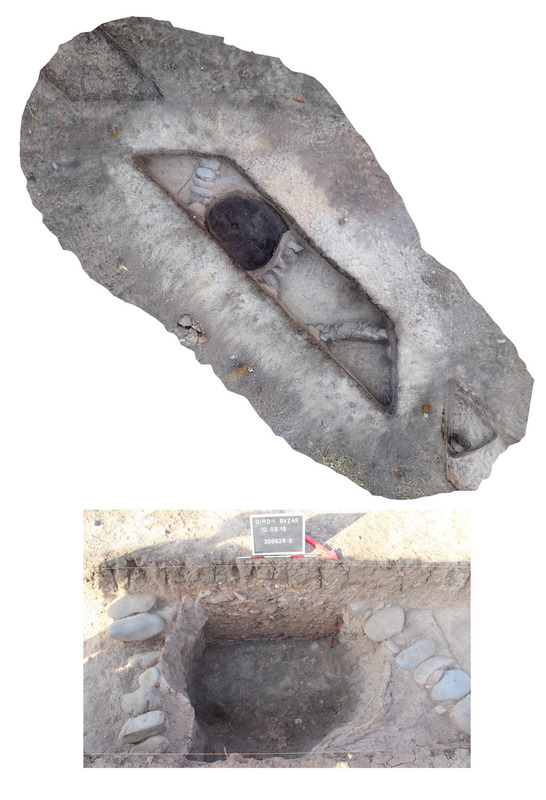 This Connecting Trench would serve to connect and improve our contextual understanding of these two separate excavations, and to investigate if similar or noticeably different structures and activities were to be found between these areas. The Connecting Trench runs roughly 43 m at an angle across six of the site’s 10x10 m squares, on a roughly NW-SE alignment, about 3-6 m distant from and parallel with the modern cut through the mound, which had provided us with a cross section through the deposits when the chicken farm was constructed. Moving west through the Connecting Trench, it is not until we reach the eastern end of Square 270938 that we have any indications of surfaces, or even occupation material. It is a further 10 m before we find the first structural wall located at the eastern end of Square 268928; we are now only 1 m away from the larger scale excavations with their substantial architectural discoveries. The general aim of the excavation in the western trench was to understand the layout of the architecture and the occupational sequence on the western edge of the settlement area where the magnetometer survey had revealed promising structural remains worthy of investigation: a regular layout with parallel walls oriented along a north-north-west axis, with several narrow rooms or alleys lining larger and originally roofed areas. Additionally, some stonewall remains were visible on the surface of Square 267931 and in its vicinity, confirming the general impression given by the geophysical survey. The western limit of the area available for excavation is defined by the fence surrounding the farm, which causes Square 267931 to be cut at its north-western edge. 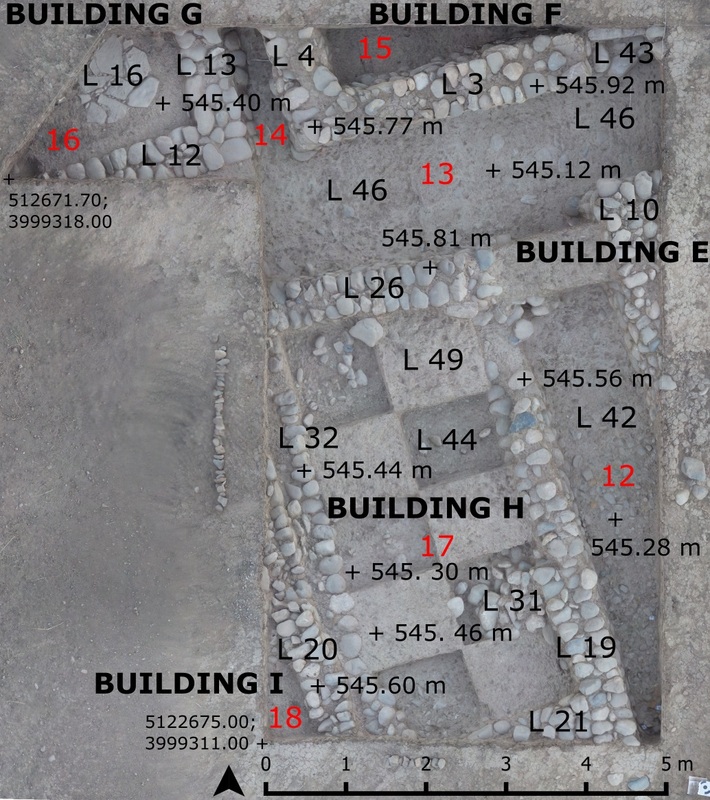 The excavation of this trench revealed structures belonging to five partially excavated buildings (E, F, G, H, I), which seem to be single-room buildings, separated by three alleyways (12, 13, 14). An interesting installation was found in the north-west corner of the trench, in room 16. Two walls (Locus 267931:012 and Locus 267931:013) bond and create a corner that defines the installation, which in turn consists of large flat stone slabs (Locus 267931:016) sunk into the floor (Locus 267931:029) and covered by a layer of burnt debris (Locus 267931:014). The installation (Locus 267931:016) lies about 50 cm above the surrounding contemporary occupational surfaces in “Alley 13” and “Alley 14” and the foot of the walls of “Building G”, as visible on the exterior. It is paved with large flat stone slabs, with tiny pebbles used to fill in the gaps. The surface shows traces of staining by fire and was covered by an approximately 10 cm thick layer of burned debris (Locus 267931:014). Fragments of burnt plaster, mud brick and charcoal were found in the debris. Finds include a limestone pounder (267931:014:036) and parts of a large smashed vessel (267931:014:005). It is likely that food was cooked in this area. Buildings E, F, G, H were founded on the virgin soil. Building H, the only one entirely excavated, showed signs of a second, later, phase, to which also Building I seems to belong. The 2015 excavation season brought to light about 600 diagnostic sherds from a variety of hemispheric bowls, carinated bowls, plates, jars and pots. 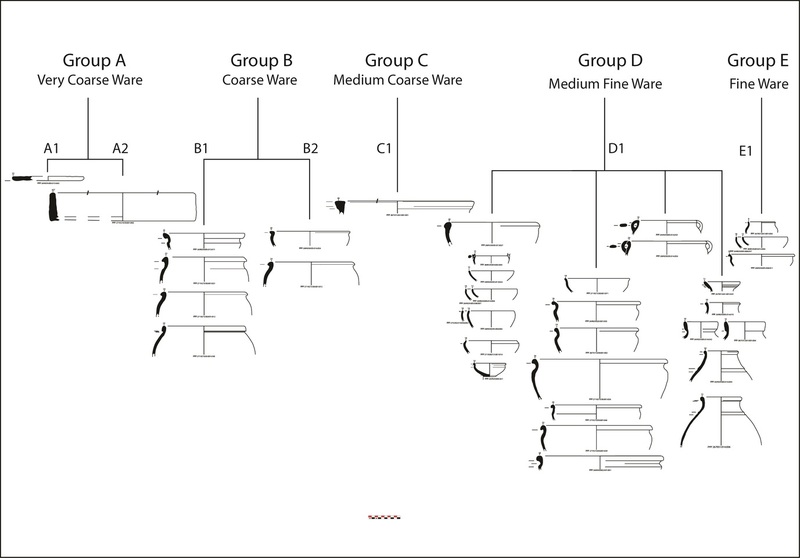 After a macroscopic and provisional analysis of the fabrics, 5 fabric groups have been identified, from very coarse ware to fine ware. Future thin section analyses will be carried out to better define the fabric groupings. Overall, the ceramic repertoire from Gird-i Bazar shows similarities with pottery from both North Mesopotamia and West Iran, while retaining an evident local character. Some fashioning techniques, such as the burnishing method, are closely comparable to techniques attested in the Western Iranian materials, while the morphological types parallel the Assyrian shapes. Gird-i Bazar pottery seems to be in an “in-between” situation, and this is very fitting for the location of the Dinka settlement complex in the Border March of the Palace Herald, whose function in the Assyrian Empire was to broker contacts with the polities adjoining to the east. 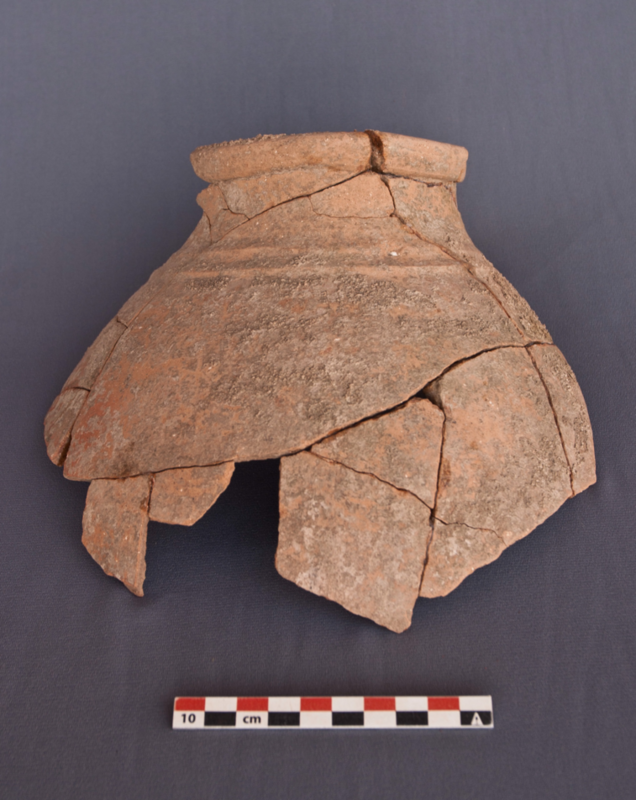 Assuming that (some of) the pottery was made in Gird-i Bazar, the site’s location in a permeable border area and along the main route across the Zagros mountain range provides a setting that enables the exchanging and adopting of features of pottery-making from east and west. 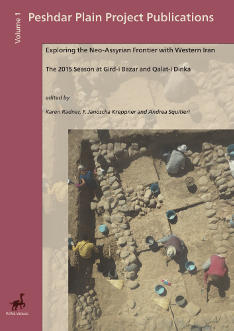 Further study of the pottery material, especially the chaînes opératoires, will undoubtedly produce deeper insights into the cultural traditions and relationships of the people of Gird-i Bazar and in the wider south-western Kurdish region within the Assyrian Empire. During the first season of excavations in Gird-i Bazar a total of 48 artefacts of special interest were registered as small finds and 14 of these were deposited with the Sulaymaniyah Archaeological Museum. 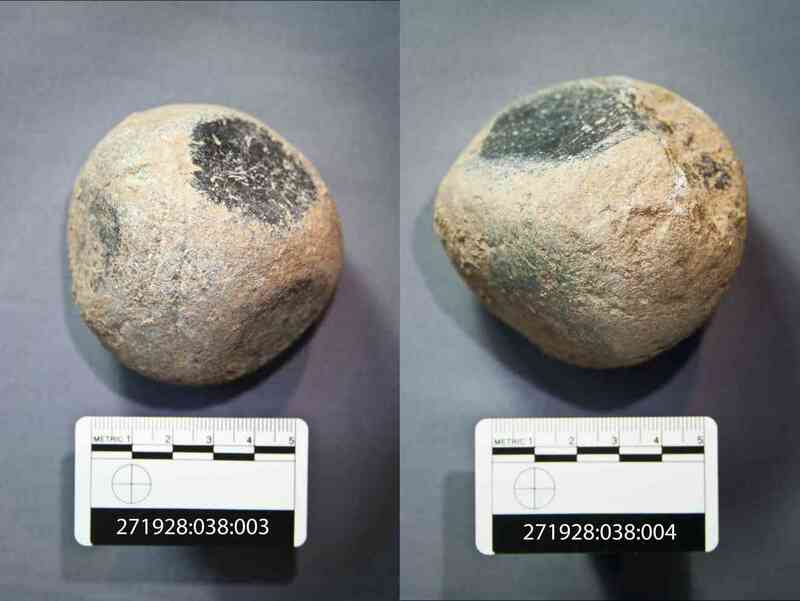 Though relatively few in number, the artefacts given small find status comprise a wide array of artefact types including metal objects (fragmentary and complete), a clay figurine, worked stone objects that are most likely tools and jewelry and a baked brick. Generally speaking, the small finds from the 2015 excavations at Gird-i Bazar represent an assemblage of small, somewhat humble objects that seem to be predominantly non-elite in nature. Moreover, there is no strong indication of a military presence. Particularly striking is the absence of large ground stone tools, such as querns and large mortars, from the floor surfaces, since these tools are very often associated with domestic contexts involved in food production activities. The absence of such tools at Gird-i Bazar, coupled with the scarcity of animal bones found on the floor levels (see Radner et al. 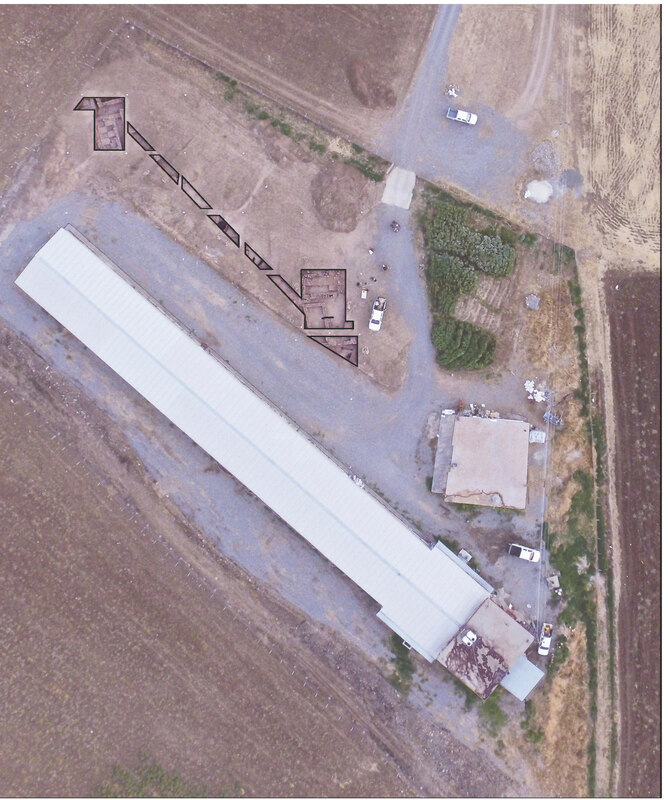 2016: 79), may suggest that food was processed outside the buildings and portions of buildings excavated in the 2015 season, and that other areas of the site (indoor and/or outdoor) were dedicated to this activity. Alternatively, one could suggest that, when the site was abandoned, large ground stone tools were removed or discarded. Melissa Rosenzweig’s future analysis of micro- and macro-plant remains from the floor levels should improve our understanding of the dynamics of food processing and consumption within the buildings of Gird-i Bazar.